Patriarch Alexiy II, the head of the country’s powerful Orthodox Church, has died at the age of seventy-nine, Russian media reports say. A spokesman for the Moscow Patriarchy of the Russian Orthodox Church confirmed the reports, adding that Patriarch Alexius II passed away on Friday morning. Born as Aleksey Ridiger, Alexiy II was enthroned on June 10, 1990, replacing Patriarch Pimen I, less than a month after the latter’s death. 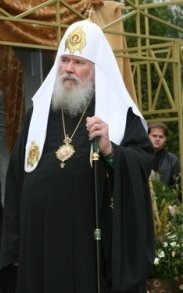 In 2006, he called the Vatican’s action in the traditionally Orthodox parts of Russia “extremely unfriendly” and “non-brotherly,” according to Russian reports. Unlike those in Constantinople, the Russian Orthodox have tended to distance themselves from unity with Rome and some of them still seem to accept some Church of God doctrines such as Millenarianism. It is not clear what will happen next, but because of his timing, the next Patriarch of the Russian Orthodox Church will help (at least indirectly) support the fulfillment of some biblical prophecies. This entry was posted on Saturday, December 6th, 2008 at 12:26 pm	and is filed under Religious News.